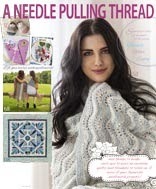 I’m thrilled to be a Friday Feature on The Needle and Thread Network. My name is Marianne Haak, better known as Mariquilts, if you happen by The Quilting Edge (www.thequiltingedge.com). I’m from St. Albert, Alberta most of the time, but also reside in Victoria, British Columbia, especially when I’m trying to escape Alberta’s cold winters. I’m a quilter and addicted in every way. Having grown up in a very creative home, I was playing in my mother’s scrap bin from an early age. I am mostly self-taught except for those two years of mandatory sewing and cooking classes in Junior High school, and as my family will attest, the sewing took…the cooking, not so much. In the early years I mainly sewed clothing for myself and later for my four children. Since money was scarce, I also sewed for my home. I made my very first quilt in the mid-seventies but only dabbled at quilting here and there, over the years. As I was dabbling, I was also researching different quilting techniques…anyway, that’s the excuse I gave myself every time I wanted to buy a new quilting book, with some new alluring method inside its' colourful cover. I started quilting a little more seriously about eight years ago, and had wealth of knowledge at my fingertips (this is well before my blogging days). My most exciting accomplishments, of the past year, have actually been a direct result of blogging, which I have been doing for about two and a half years. The baby quilt I made, for my first little granddaughter, caught the eye of Fons& Porter’s LOVE OF QUILTING and my quilt, CIRCLES FOR PAIGE, was published in the January/February2013 issue. Next, I made the quilt, COLOUR SHOT, using Oakshott Cottons, which was privileged enough to hang in the Oakshott booth, at the Birmingham Festival of Quilts. 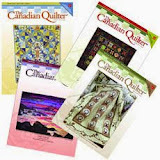 Last but not least, I was approached by MACHINE QUILTING UNLIMITED to write an article on the topic Quilt as You Go. This resulted in a two part article for the March/April 2013 issue (part 1) and for the May/June 2013 issue (part 2). This project really pushed me out of my comfort zone, since I had to write the article and do my own photography (approximately fourteen photos per article). I must admit I was pretty excited to open that March/April issue. The photos I’ve included are from the QAYG article. My future goals in quilting are to make what I love and love what I make. I have multiple projects on the go at any given moment and love to keep pushing my ideas a little farther. I love sharing what I discover along the way. Thanks again to The Needle and Thread Network for inviting me to share a little about myself. congrats on the magazine articles. you deserve all the recognition you get. 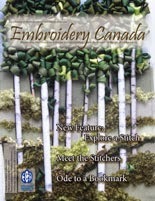 Great to read about your quilting journey here. Congrats on all your successes and may you have many more! I've been following you for a while so it's nice to find out more about you. Thank you. Lovely story Marianne. Thanks for sharing! 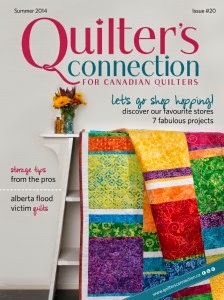 It so interesting to read a Canadian quilter's story! I love your quilts and I have the magazine and am waiting for the next one. I still haven't tried the QAYG method yet but it's on my list. Of course, I love everything you do, but Colour Shot is my all time favourite. Thanks for sharing your story and congratulations on all your success. one of my favourite blogs...always different, a bit edgy, so much colour. You are new to me so I am excited to play catch up! It’s great to to be introduced! I love Marianne and her fearless use of colour! Marianne it is so nice to meet you. I am a follower of yours and you dure do know how to use color...Your quilts are beautiful.. Your blog is among a handful of favorites, your work is so inspiring! Thanks for sharing so much of what you know with us, your readers! Congrats! I love reading your blogs and am inspired to start a quilt of my own. Thank you all for so many lovely comments. And thanks again for featuring me. 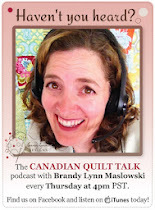 Mari I just found your blog, and your quilts take my breath away! Oh that I could be so free, so advertureous, so daring, so fearless! You are a wonderful inspiration. Just keep doing what you're doing - it is wonderful!